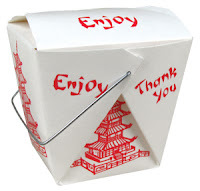 Nothing says the weekend like some chinese take-out, right? C'mon guys...didn't you listen to LFO back in junior high? 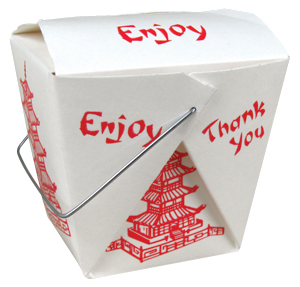 ;) Chinese food is notorious for its sodium and saturated fat, enough to make you sick. I know one of the favorites in our household is General Tso's chicken. This one is kinda a doosie because it's made with battered, fried chicken. A typical serving of Mr. Tso will run you about 1,300 calories, 3,200 milligrams (woaahhh buddy) of sodium, and 11 grams of saturated fat. I'm thinking if you're ordering in Chinese, portion control is key, along with drinking enough water that day to fill a kiddie pool. If you're craving Chinese flavors, but not the high blood pressure, why not try making your own Chinese-inspired meal at home? This way, at least you're controlling the ingredients, and you might save yourself some $$ too! 1 to 2 tbsp EVOO (or you can just spray your pan with a little PAM). 3-4 Chicken Breasts, cut into 1/2 inch pieces (depending on this size pieces, aim for about 1.5 lbs of chicken) -- I typically marinate the chicken overnight in some teriyaki marinade. Step 1: Heat up a 12-inch skillet to medium heat and add your EVOO (or PAM), garlic, and chopped onion. Let this cook until the garlic and onion begin to turn golden brown. Step 2: Add your chicken, and let it cook for about 4-5 minutes, until lightly browned. Step 3: Add the red and yellow pepper, broccoli, corn, and carrots to the mixture, stirring frequently for another 5 minutes. Step 4: Add the water chestnuts. Step 5: In a small bowl, combine the chicken broth, Hoisin sauce, soy sauce, powdered ginger, and stir. Once this is well-mixed, add the cornstarch to thicken. Step 6: Pour the sauce mixture into the skillet and bring it all to a boil over medium heat. Step 7: Reduce the heat to medium-low, and let it all simmer for another 4-5 minutes, until the sauce thickens to your desired level. Then you are ready to serve it all up. 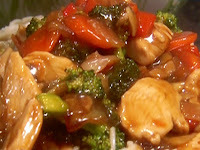 You can serve the stir fry over a small amount of brown rice, or you carb-o-phobs can just eat it naked! 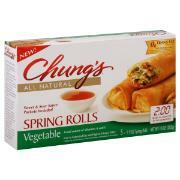 Chung's All-Natural Spring Rolls -- only 80 calories per roll, and they're a good size, not bad! I buy these at Dominick's for any of you Chicago people. Since it's Friday, and I've been rolling with a wine recommendation for the weekend meal ideas, you can enjoy this meal best with a light-tasting white wine, like a Riesling or Pinot Grigio. My favorite Riesling is Schmitt Sohne.